I see you. The girl with too-thick eyeliner and overly contoured cheekbones. Your clothes reveal precious secrets about your body. The pictures you share with the world show a beautiful girl who doesn’t quite believe it, but you desperately try to convince everyone else that you do. Everything about your life revolves around getting him to notice you and then stick around. You compromise who you really are if it means the guy you’re crushing on likes you back. When he looks your way and smiles, you know he must be The One. He gets you. He says the things you need to hear. He completes you. I see you. The woman who never has to share the remote when it’s time to binge on Netflix. You fill up your free time with all the things you’re into because you can. You schedule weekly girl’s nights and countless first dates, but long for the familiarity and companionship of a spouse. The image you project to the world is one of an independent and confident woman – and you are – it would just be nice to have that special someone to walk beside you. To fill the empty spaces in your heart. To help complete your life. I see you. The wife who dotes on her husband, treating him like royalty. Your daily desire is to meet his needs above all others. Your social calendar suffers, but if his clothes are clean and his belly is full you don’t mind so much. To outsiders you appear to be the perfect wife, but you humbly brush aside their praise. Serving your man is the least you can do – after all, he’s a keeper! You’re so lucky to have him. You tell yourself it’s ok to obsess over his life because he’s seamlessly completed yours. I see your striving, hurting, longing heart. I get why you’re tired of being single. I know how easy it is to pour yourself out for the one you love. I just wish you could see that it’s not a boy or a man you need. 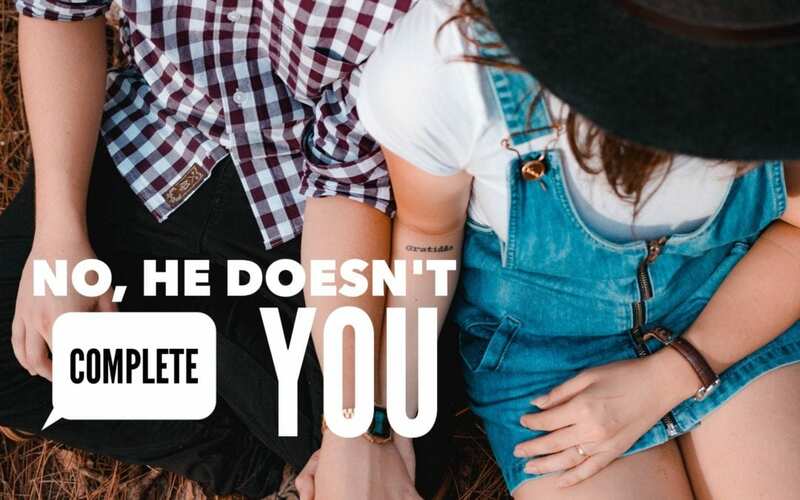 No, he doesn’t complete you. But Jesus can. He will. He does. The Enemy has made you believe that everything you need can be found in an earthly relationship. The truth is, no relationship will ever come close to what it’s meant to be until your relationship with Christ has become the most important thing. You see, I was that girl. Riddled with insecurities, I had daddy issues that left gaps in my heart. I met a guy who swept me off my feet and quickly became the axis on which my world revolved. To keep him interested, I morphed into a chameleon of sorts, molding myself into what I thought my boyfriend wanted me to be. I felt a constant need to be in this person’s presence so I let my friendships suffer. I lost interest in my own life and instead forced my way into every detail of his. He tolerated this for a while, but eventually the pressure I put on him to be my everything was just too much for him to handle. He broke up with me and utterly shattered my entire world. I didn’t want to be alone, but there I was. The pain I felt was magnified by the fact that I didn’t know who I was without him. In that moment, I began to realize my mistake. I had misplaced my affections. The ardor that my soul had been created to lavish on my Savior was being directed at a mere boy instead. What a tragedy! All this time I had been essentially worshipping my boyfriend and neglecting the Lord. If you find yourself relating to my story, I’m here to tell you that Jesus Christ is better. If your identity is wrapped up in another human being, that relationship can never be healthy. Until you truly believe that you are a uniquely created, valuable, cherished daughter of King Jesus, you will continue looking for someone else to make you whole. Just as He did for me, Christ tells you in His own words the truth: you are complete in Him. God alone holds the key that unlocks the deepest desires of your soul. He knows you better than anyone. He loves you so deeply and perfectly. Nothing else compares! When someone breaks your heart, Jesus steps in to heal every wound. When loneliness overwhelms you, Jesus offers comfort and friendship. When you fix your eyes on Jesus, He breathes new life into your marriage. Daughter, we’re all incomplete. We’re all looking for love and acceptance – it’s just way easier to access than we dare to believe. 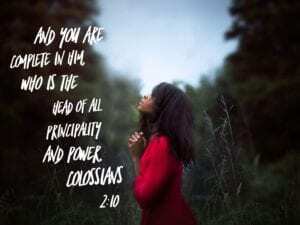 My prayer for you today is that you will find your wholeness and identity in God alone. That you will let Him complete you as only He can. We are starting a new YouTube Channel! If you love videos, check us out! We’ll be sharing testimonies, Q&A with a licensed counselor, and more and more videos about God’s truth! We’d love to have you!! Subscribe to our BraveGirl Community YouTube Channel by clicking on the link below! Sometimes I have good ideas and other times I have absolutely ridiculous ones. Like the time I decided to take my two small children to dinner at a sit-down restaurant when my husband was out of town. Autism affects my 6 year old son’s mind in such a way that it can be both a brilliant gift and a debilitating hindrance, depending on the day. No matter how much we prepare, sometimes something so insignificant can completely set him off. He sees a fly. His peanut butter sandwich has slightly too much peanut butter. The lights are too bright. The soda machine is too loud. Because of this, we live our lives trying to anticipate all of these hidden factors, but it doesn’t always work. This was one of those times. As soon as we sat down with our food, I immediately had to clutch my plate so it didn’t get tossed. His face turned bright red and he screamed at such a high pitch I could see the people around us wincing. He stiffened out and slid under the table. He jammed his fingers in the cracks in the wall. He tossed his toy across the restaurant. I ran to get it as I barked at my daughter, “Go get some to-go boxes!” I scraped food off our plates while simultaneously trying to keep him from clawing his own cheeks with his fingernails. I gathered up all of our things, attempted to balance our food and pick him up at the same time, all while trying desperately to avoid eye contact with all of the people who I assumed were judging my parenting because he looks so “normal”. I was so tired of living life in this constant state of embarrassment, seclusion, and exhaustion. So very tired. Then it happened. A hand reached out and gently touched my shoulder. “Hey, I just want you to know this happens to all of us and it’s ok. It’s usually her!” She pointed to her small daughter sitting at the table. She gave me a warm, reassuring smile and my eyes filled with tears. I squeaked out a “thank you”, hung my head, and bolted to the car. All the way home I couldn’t stop thinking of the kindness of that woman. She was a stranger who didn’t know me, but sympathized with my situation and wanted me to know I wasn’t alone. It meant so much more to me than the quick “thank you” I muttered and I regretted that was all I was able to offer in return at that moment. How many times have I had the same opportunity to reach out and touch a shoulder and I’ve let it go by? How many times have I missed the opportunity to say some of the most important words a fellow frustrated, worn out woman can hear? I love the Message version of 1 Thessalonians 5:14 . I know that night in the restaurant, I sure did feel like an exhausted straggler who needed to be pulled to my feet. All it took was a little encouragement from a stranger to remind me that there are probably more people looking at my parenting struggles with empathy than with judgment. I hope that I can open my eyes to the other stragglers around me and have the courage to place my hand on their shoulders. I pray that with God’s direction, I can be brave enough to pull them to their feet by offering a kind word, a helping hand, or even just a reassuring smile. If we truly are the hands and feet of God, we must show the world that He is good by taking care of each other when we feel that nudge in our hearts telling us that it’s needed. If you feel like you are the exhausted straggler today and no one is reaching out, God sees you and He will pull you to your feet. Hand Him your weariness, your problems, your frustrations, and your worries and He will carry them for you. Now I was the one who was shocked! We can’t “gossip”. That’s so sinful! How dare she just come out and say that! At least my friend wasn’t in denial about it. She called it what it was. She named it and it made me think twice about what I was about to reveal. Good southern Christian girls like me don’t like to name our sin because acknowledgement brings that uninvited guest named Conviction to spoil our party. Gossip seeps its’ way into my perfectly innocent conversations, even ones that start out to be godly and life-giving. It is anything but harmless and we have to stop. I didn’t recognize gossip as a problem in my life until my own filthy laundry became the hot topic. When people have been whispering about you, it is beyond hurtful and embarrassing. It permanently damages friendships and deteriorates trust. It’s anything but harmless. God, help me not to harm others with my desire for entertaining conversation. Being highly experienced in this area, I’ve narrowed gossip down to four types so it will be easier to recognize the next time it sneaks into your conversation. Even if you are dying to spill someone else’s secret and you know you can trust your best friend, it’s still gossip. If it’s not YOUR business, keep it to yourself. If you are on the receiving end of a gossipy loaded question, you are not required to answer! People will respect that you politely refuse to give up information and you will prove yourself to be trustworthy. Someone hurts you so you tell others all of the unattractive things you know about her life. Don’t let your short term emotions cause long term effects. You will regret it later. Of course we need to pray for and support each other. Just always make sure to keep your motives and your sincerity in check when you reveal anything personal about someone else’s life. As you go back to your workplace, play dates, and PTA meetings, keep in mind what God’s Word says about gossip. Learn to recognize it, call it by name, and put a stop to it. Don’t let this “innocent” sin creep its’ way into what could otherwise be sacred spaces of trust, encouragement and friendship.